*Information for this section is provided by the US Fish & Wildlife website, and by Jody Millar, Retired US Fish & Wildlife Service Bald Eagle Recovery Coordinator, American Eagle Foundation Eagle Grant Coordinator. Bald Eagles were removed from the federal list of threatened and endangered species in 2007, and are no longer protected under the Endangered Species Act. 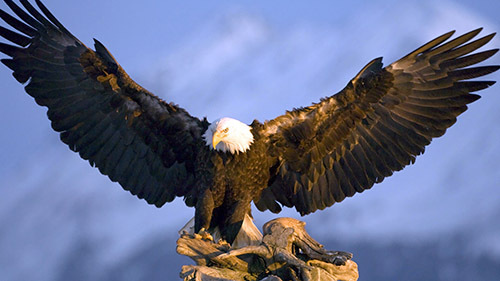 However, Bald Eagles remain protected under the Bald and Golden Eagle Protection Act and the Migratory Bird Treaty Act. Originally passed in 1940, this law provides for the protection of the Bald Eagle and the Golden Eagle (amended in 1962) by prohibiting the take, possession, sale, purchase, barter, offer to sell, purchase or barter, transport, export or import, of any Bald or Golden Eagle, alive or dead, including any part, nest, or egg, unless allowed by permit. ‘Take’ includes pursue, shoot, shoot at, poison, wound, kill, capture, trap, collect, destroy molest or disturb. Activities that directly or indirectly lead to taking are prohibited without a permit. ‘Disturb’ means to cause: 1) injury to an eagle, 2) a decrease in its productivity, or 3) nest abandonment. ‘Disturb’ also covers impacts that result from human-induced alterations such as tree clearing around a nest site even when the eagles are not present, if, upon the eagle’s return, such alterations interfere with or interrupts normal breeding, feeding, or sheltering habits, and causes injury, death or nest abandonment. There are a number of different types of permits available for authorizing take, possession, and transport of Bald and Golden Eagles. Use the links below to learn more about the the most commonly used authorizations (permits) that are available for people whose activities may take eagles or their nests. The Bald Eagle was removed from the List of Threatened and Endangered Species in 2007 because the population was considered recovered. Additional information about Bald and Golden Eagles. The Migratory Bird Treaty Act is a Federal law that protects birds that migrate across international borders. The countries partnering in this are Canada, Japan, Mexico, and Russia. The Migratory Bird Treaty Act (MBTA) was originally written in 1918, and has been revised and updated multiple times since then. It prohibits the taking, killing, possession, transportation, and importation of migratory birds, their eggs, parts, and nests except as authorized under a valid permit. More information. The Lacey Act was originally passed in 1900 and has been amended multiple times since. It protects Bald Eagles by making it a Federal offense to take, possess, transport, sell, import, or export their nests, eggs and parts that are taken in violation of any state, tribal, or U.S. law. It also prohibits false records, labels, or identification of wildlife shipped, prohibits importation of injurious species, and prohibits shipment of fish or wildlife in an inhumane manner. More information. State governments can enact state laws that afford more protection than Federal laws to conserve wildlife species. For example, Bald Eagles may be protected by a state endangered species law. You can contact your own state fish and wildlife agency to see if your state has laws or management guidelines that protect Bald or Golden Eagles. Eagles are unlikely to be disturbed by routine use of roads, homes, or other facilities where such use was present before an eagle pair nested in a given area. For instance, if eagles were to build a nest near an existing home, cabin, or place of business, it would not likely affect the nest or eaglets. An exception to this is when Eagles build nests near power lines that fledging Eaglets may come in contact with. In this case, you can encourage local power and utility companies to make their power lines more avian-friendly. However, intentional commercial development (malls, power lines, power plants, pollutant-heavy factories, etc) where Bald Eagles are already nesting, roosting, wintering, or foraging can negatively affect the Bald Eagle population and Bald Eagles’ safety/health in that area. This is when you should take action. Your most valuable resource in making a case against any potentially threatening development/activity is thorough documentation. Pictures and videos make for great visual proof. Annual records that document nesting activity or roosting/foraging/wintering activity indicate long term, previous use of an area by Bald Eagles. Give the developer the benefit of the doubt. Contact the developer and inform them that there is a Bald Eagle nest or active Eagle roosting/feeding/wintering area near their development/project/activity. If they are unaware of this fact and are early on in their development/project/activity, request that they reconsider their location choice, OR encourage them to create a cooperative eagle protection plan that will mitigate their impact on any nearby active nest(s) or Eagle roosting/foraging/wintering areas. Situations may vary. Once they are aware—or if they were already aware—of the Eagle nest or habitat, but still intend to proceed with potentially threatening development activities, ask if they have performed an environment impact study and/or obtained a Take Permit from the USFWS. If they have obtained a permit, call your regional USFWS Migratory Bird Permit Office to verify. Please verify that the development/activity that is actually taking place matches the development/activity approved by the USFWS. Click HERE to find the contact information for your region’s USFWS Migratory Bird Permit Office. If planning, development, or activity proceeds without obtaining a permit—or if their application for a permit was denied—you must contact your regional USFWS (Federal) Law Enforcement Office and State Law Enforcement Office so that they may take action to cease the planning, development, or activity. Click HERE to view the contact information for your (Federal) USFWS Regional Law Enforcement Office serving your state. Find contact information for a state-level wildlife law enforcement officer. Choose your state and then scroll down until you see ‘Special Agent In Charge Office.’ That is the direct office to contact. If you have had trouble making headway with your efforts to protect a threatened eagle nesting, roosting, foraging, or wintering site, please contact us. Or, if you had great success protecting an Eagle Nest, let us know! We’d love to hear your success story!